This weeks book would be great for back to school time, but it is such a cute book that really, it is great anytime! 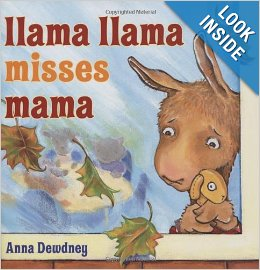 Llama Llama Misses Mama by Anna Dewdney is a cute rhyming book that follows little Llama through his first day at school. 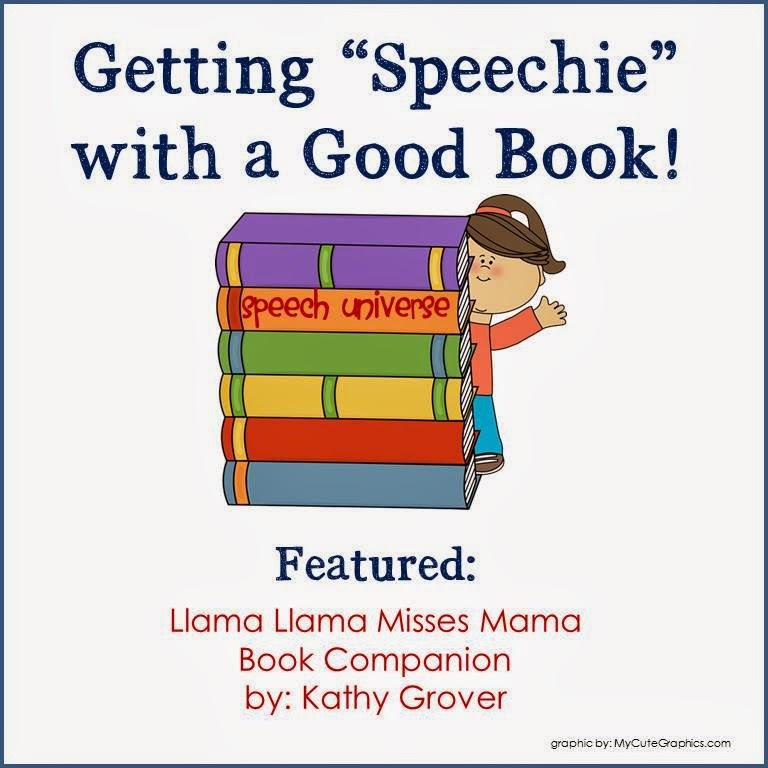 The great book companion packet that I am featuring this week is by Kathy Grover of Speech All The Time. This packet was designed for use with young children ages 3-6. What is great about any book companion from Kathy is that she gives detailed lesson plans that typically cover four sessions. The lessons are so detailed that they give you ideas for exactly what to say for each lesson. All you need is a book, paper, and crayons. Kathy guides you through a picture walk for the whole book with questions for each page. She then suggests that you read the book. Finally, there is a little craftivity that you can do with just paper and crayons. Materials Needed: Book, Large Character Cards, "How Do You Get to School" mat, vehicle pictures, Center pictures, "Things at School" cards. First, Kathy suggests a discussion about the book. There are character cards that can be used to display as visual cues. She then guides you through reading the book again with questions for each page of the story. Discussion about Centers using Center pictures (mats): This is great for comparing how the student's centers in their classroom are similar to the ones in Llama Llama's classroom. There are also "Things at School" cards that they can use with the center mats to do a sorting activity. Today's session focuses on rhyming and following directions. The materials that you need are: Book, Rhyming cards, Shelf mat and toy pictures. The first activity is Rhyming. The rhyme cards are made to represent words that rhyme from each page of the book. You can place the card in front of the students while you are reading the page. Then, when you get to the second word that rhymes on the page, pause, and point to the picture on the card to cue the student to say the rhyming word. The next activity is Following Directions with the concepts top, middle, and bottom. You can use the shelf mat and toy pictures from the "Things at School" cards. The last session focuses on story elements. The materials needed are: Book, Story Element Circles, and Story Map. Kathy does a great job of guiding you through using the circles and the story map. The directions are again, very detailed. There are additional acitivies included with this packet that focus on Personal Pronouns "he" and "she", Present Progressive Verbs, and Final Consonant Deletion. This is a great, detailed book companion that your preschool-kindergartners will love! You can get this packet HERE. You can find Kathy at her TpT store and on Facebook. Stop by and say, "hi!" This was a wonderful review and preview of my companion. Thank you Jen.